Besøg to af Grækenlands UNESCO-listede seværdigheder på denne 2-dages tur fra Athen. Tour de klassiske ruiner af bjergsiden af ​​Delphi, en gang betragtes som verdens centrum og derefter krydse Thessalian Plain for at besøge middelalderlige klosterklostre i Meteora. Lufthavnstransport med bus, overnatning på 3 eller 4-stjernede hoteller, daglig morgenmad og aftensmad, adgangsgebyrer og Athens hotel afhentning og afgang inkluderet. Many have said that this tour has a lot of travelling, they are right. We had the tour guide that had limited knowledge of English and who spoke way too long on each subject thereby minimising our time to see the attractions, especially at Delphi. This tour would be much better by leaving a little earlier, stopping for 5 min photo opportunities on the way there were many scenic opportunities, but not chance to view due to time constraints and having more time at Delphi. I came away seeing no more than a few ruins, had no idea what the place would have really looked like one other guide had a map to show his people, not ours and no time at all to visit the museum although entry was included in the ticket price. Meteora is truly magnificent, not their fault it rained heavily for most of our visit. Hotel was great with a fantastic view of the rock formation we were 4 star. Food stops left a lot to be desired, all were demanding cash, no receipts no wonder Greece is in a mess!, although they accepted cards if you told them you had no other money. One very large place virtually had only enough food on hand to cater for our bus, with very little choice. So this tour could have been great, with the right guide and a little more time. This was an amazing experience. I met some great people on the ride to and from and the sites were breathtaking. I would do this again if given the chance! 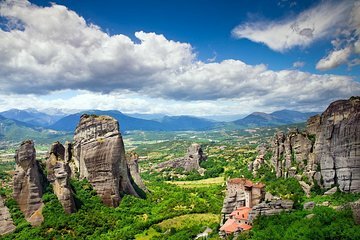 I find this tour very good especially the Meteora. Our tour guides were excellent. We had 2 guides, one for Delphi and another for Meteora. They were very friendly and funny. They both provided a lot of good information about this tour. The tour was also very punctual on departure and return as well as all the sightseeing spots and lunch breaks. Absolutely awesome trip! I agree with the other reviews that more time should be given for Delphi Museum. Your ticket covers it, so go see it for at least 30-45 minutes. Start the trip 30 minutes early or Key should be more efficient in the morning loading busses.. They wasted 45 minutes loading people. Everyone should boycott this tour until they add it at a fundemental part of the tour. Maybe cut the icon store time at the end-waste of time and I'm sure a money maker for Key. Otherwise Marie did an awesome job. Two day Delphi and Meteora was amazing! Our guide, Sofia, was very friendly and knowledgable!! Itinerary was well planned, nothing was rushed or prolonged. Would definitely recommend this tour! Just one thing they don't tell you, you have to follow dress code when visiting the monasteries at Meteora. Make sure to have long pants for the gents, and long skirts for the ladies no pants. Absolutely fantastic in every way. Our tour guides had a knack for getting us ahead of other tour groups. I do wish we'd had more time at the sights but it would not have been practical in the 2 days we had. If we had kept the initial tour guide and included the Delphi museum, we would have rated this 4 stars. Katerina was amazing in delivery and knowledge. She was with us Athens to Delphi. Unfortunately our group was then turned over to another woman, who may have had a lot of knowledge, but understanding her was almost impossible. This assessment was shared by a couple from Germany and other Americans. Yes, her accent was heavy, but it was the lack of organization of her thoughts and sentence/paragraph structure that made most of what she said very confusing. It didn't matter where we sat in the bus, so volume was a non-issue. Not including the Delphi Museum, which is highly touted, is an unfortunate omission for this itinerary. Other than that the inclusions and accommodations were quite good. Excellent! Everything was great. Our guide and the tour. Although I think the time at Delphi wasn't enough, there were too many things to see! The hotel DIVANI KALAMBAKA was perfect. This is amazing tour I was so lucky with this fun group tourist also our driver he can sings. He sang to entertain us during the traffic jam in Athens. Our tour guider do excellent job. She is fun and has lots of knowledge in history of the tour. She is deserved more tips from all of us included the driver. We were in heaven!